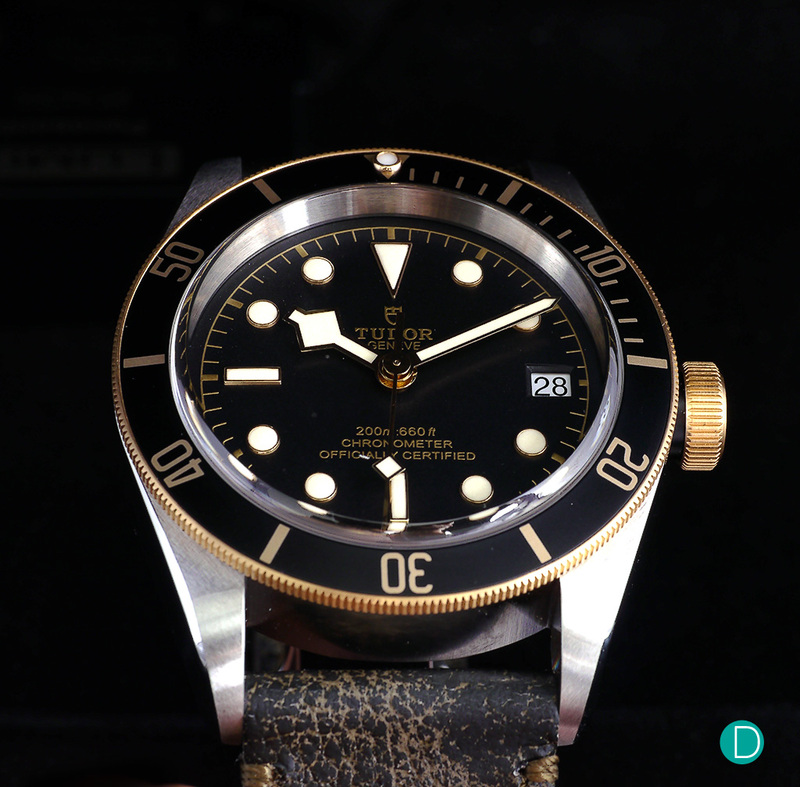 We take a look at one of the most highly-anticipated watches from Tudor: the Black Bay Steel and Gold. The Heritage collection, launched in 2012, is one of the catalyst behind Tudor’s remarkable revival over the last few years. As its name suggests, the collection is inspired by the vintage watches that were previously produced by Tudor, which includes their dive watches and chronographs. In this year’s Baselworld, Tudor launched three additional models for the Heritage Black Bay collection – the Steel, Steel and Gold, as well as the Chronograph. For today’s article, we shall be focusing on our personal favourites – the Steel and Gold, or simply known as the “two-tone”. 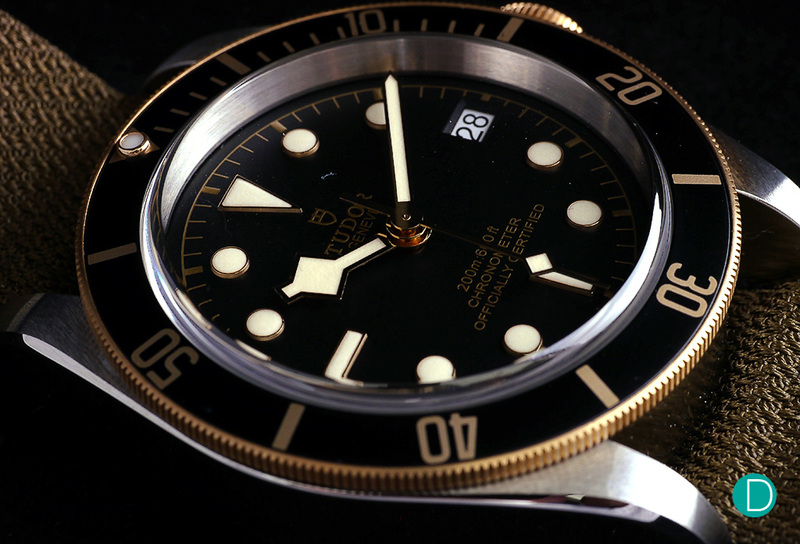 It is simply difficult not to take a second glance at the Black Bay Steel and Gold, or simply known as the “two-tone”. To our eyes, the Black Bay watches are stunning by default, with its simple and classic aesthetics which brings us back to the 60s and the 70s. It is not a novel idea definitely – there are many watches out there that are a combination of two different metals with varying success. Some watches that comes to mind include the Rolex Daytona, Omega Seamaster, as well as the novelties from the Montblanc 1858 collection (albeit in bronze, instead of gold). We are not always fans of such combinations, but seeing the Black Bay “two-tone” is certainly refreshing, and for some reason, one which works rather well with the classic design of the watch. A close-up shot of the “two-tone” Black Bay. The main differentiating factor between the “two-tone” and the other variants lies in the bezel and the crown. The yellow gold bezel, which comes with a black insert and gilt markings, gives the watch a rather nice contrast. The big yellow gold crown adds a nice touch to the timepiece as well. It is definitely more striking than some of the models in the collection, and the combination works rather well with the black gilt dial as well. The use of gold and steel also accentuates the vintage feel – which is aided by the “Snowflake” hands and the domed sapphire crystal. Other than that, the watch still retains its 41mm case, which looks and feels just right. It is manufactured using 316L stainless steel, and featuring both polished and brush finish. Despite the use of gold, the watch still gives the vibes that it is a solid tool watch. The movement in the new Black Bay Steel and Gold – the MT5612. Picture courtesy of Tudor S.A. The watch is powered by Tudor’s in-house MT5612. It is a self-winding COSC-certified movement, featuring a date indicator and a power reserve of approximately 70 hours. The movement, notably, is also fitted to some of Tudor’s other watches. They include the new Pelagos, as well as the latest Black Bay Steel. It is a solid workhorse movement, although its utilitarian purpose means that there aren’t too fanciful finishing or decorations on the calibre itself. The date function is an interesting addition. Beside the new Black Bay Steel, this is the other model from the collection that features this indicator. We are, however, divided on this. On one hand, the date function is something that is useful for many. However, some of us prefer the cleaner and more symmetrical dial that didn’t feature the additional date window at the 3 o’clock position. It really boils down to individual preferences. A wristshot of the “two-tone” Tudor Heritage Black Bay. Tudor had outdone themselves again with the Black Bay Steel and Gold. No, it is not another revolutionary watch with some mind-boggling breakthrough, but they have managed to disrupt the market with a well-priced and solid timepiece. The most affordable variant – fitted with a distressed leather strap and an additional fabric strap – is priced reasonably at CHF 3,600 (approximately S$5,015). A similar model from Rolex is much more. The watch is also available with a steel bracelet, featuring gold-filled links in the middle. That one is slightly pricier, at CHF 4,700 (approximately S$6,550). Both are excellent in their own ways, although we have a slight soft-spot for the model with the leather strap. However, this leads us to another question. What’s next for the Black Bay collection? It is certainly something that will be interesting to find out, considering that there aren’t many options or variations that are left for them to play around with. 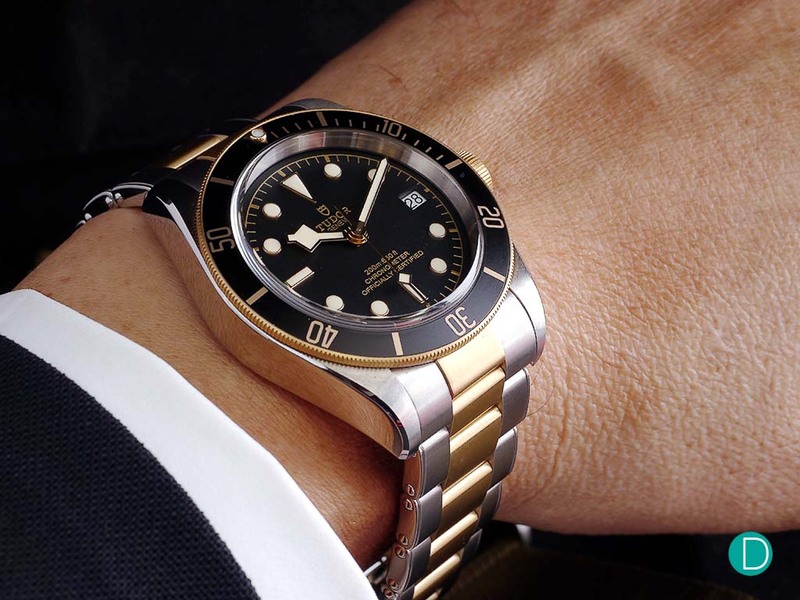 Perhaps we will see a full-gold Black Bay, or a dual-color bezel like the Rolex GMT-Master “Batman”? 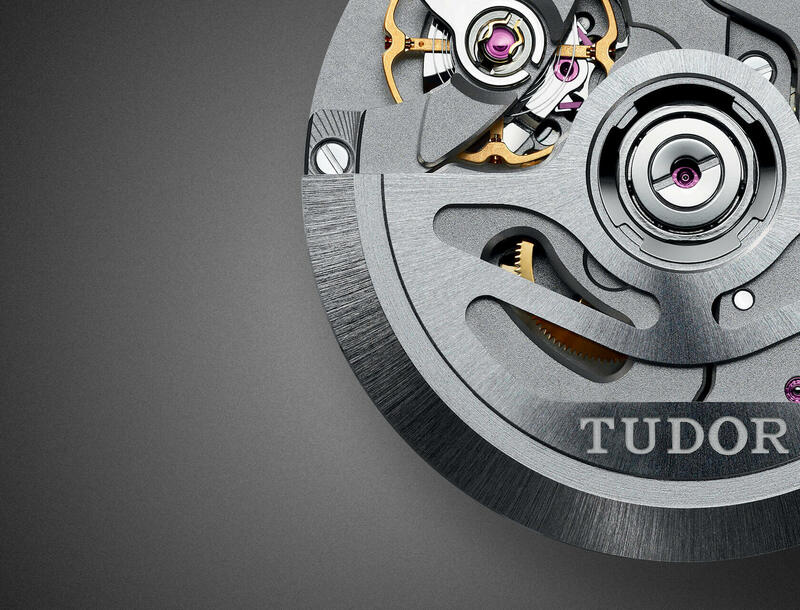 Or maybe Tudor will include other complications, such as the GMT function? Well, it is anybody’s guess. But we will surely keep our eyes peel for the next Baselworld in 2018.